Having a crowd over for brunch, or just feel like a veggie-filled breakfast? Bake this hearty breakfast for all to enjoy. This classic casserole includes white or sweet potatoes, bright red tomatoes and plenty of greens and mushrooms. White potatoes aren’t for everyone, and if that’s you, use sweet potatoes instead. Both types of potato will compliment this casserole, so no flavors will be lost by choosing one over the other. 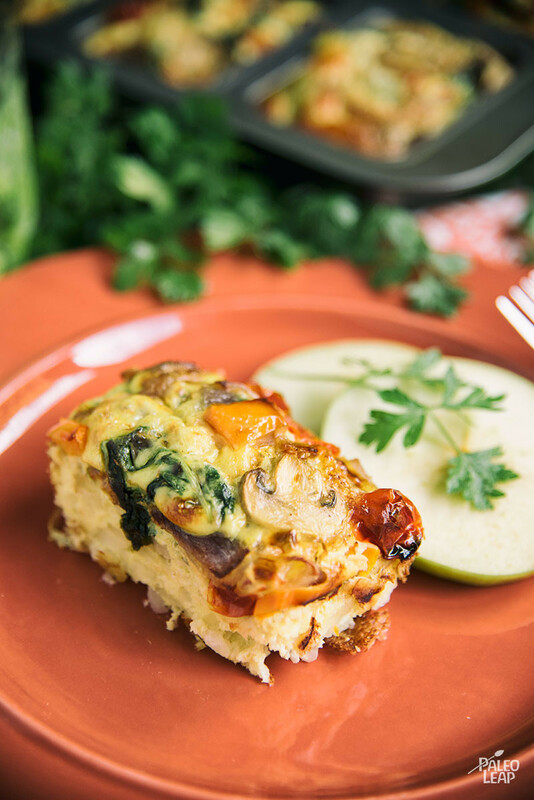 This filling breakfast would be ideal to reheat during the week, but can be enjoyed over a weekend breakfast or brunch, too. While this dish includes protein from the eggs, fat from the cooking fat and eggs, and plenty of veggies, feel free to add sausage or bacon to the casserole, or serve on the side. You can opt to serve with a refreshing side of fruit salad, too! Melt cooking fat in a skillet. Add the shredded potatoes and saute over medium-high heat for about 3 minutes. Cover and cook over medium-low heat for another 3 minutes, then place in a layer at the bottom of baking dish. Add more cooking fat to the skillet; cook the onion and garlic for 2 to 3 minutes. 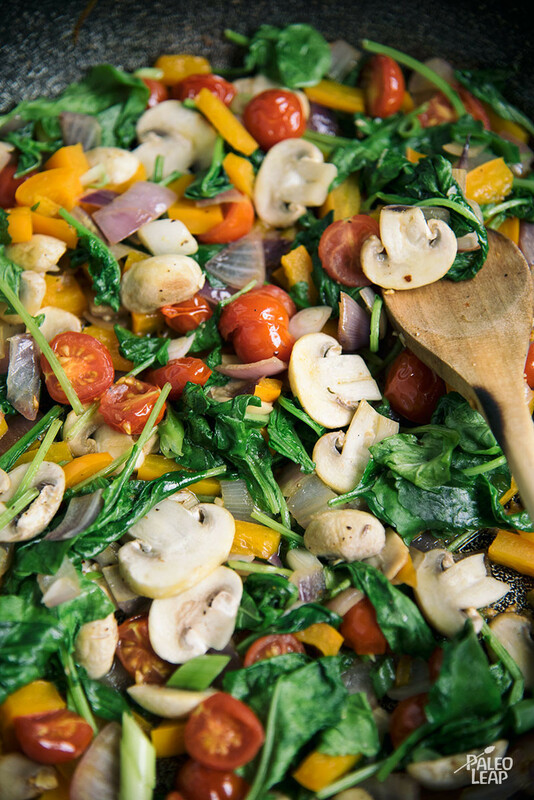 Add the bell pepper and sliced mushrooms; cook until soft, 4 to 5 minutes. Add in the fresh spinach and tomatoes during the last 2 minutes. Remove from heat and place the veggies on top of the shredded potatoes. In a large bowl, whisk together the eggs and season to taste. Pour the egg mixture over the vegetable-filled baking dish, then place in the oven.